United Airlines opened a contest for women to submit designs for an airplane, this design contest was called Her Art Here. There were two regions to represent, California and New York. I chose California where I spent half my time growing up living with my father in the summers in California and my mother during the year in Arizona. I used California’s state bird, the quail, as well as flowers of California. Here is the full article! Magical Muralism! An article on artmaking. Here is the link to the article, which can also be found in hard copy by Images Arizona. This last Saturday I was surprised and overwhelmed that the story wrote about The Three Birds in Flight was printed on the front page of The Arizona Republic. Often when you do interviews you do not know where they will go. Perhaps a digital story, maybe published in the paper or a magazine. But when they are published on the front page, it is a special honor. So thank you, and thank you for taking a risk telling a story that is complexed and nuanced. When Dianna was interviewing me, I found myself telling the real story. About love, death, forgiveness, spirit and resurrection. My spirituality is a little off color for much of our culture, because it is hand made and through experiential learning. I am not religious, although I value ritual and the sacredness it holds for many people. The collective energy. I have had so many teachers, from my mentor Jeniffer, to the gurus in kundilini yoga, authors and writers who speak to me, my dreams, visions, the children and teenagers I have had the opportunity to teach, to the homeless man on the street. Perhaps we are all teachers, teaching each other. I was asked today when I knew that I was an artist. As early as I can remember I would draw. I was always reading as a child as well, I think I probably read the most when I was a child. I would walk and read on my way to school, I would read in closets and other hideaways, I would climb trees and read. My dad would take my sister and I to a bookstore and say, you can buy any books you want, any. He was a prolific reader, still is, and that was a great gift he gave to us. So while my sister would buy Goosebumbs or Baby Sitters Club, I would buy Darwins Orgin of Species, history books and true crime serial killer books. I also took to reading dictionaries. I was always a strange child. I read anything and everything, and that set a foundation for learning that would course my whole life. Curiosity, it can't be undervalued. Surprisingly or not surprisingly I did not fare well in regular school, and did not excel until I was put in a middle school for the arts. Here I flourished and was placed in academic honors and this too would change learning for me. I began writing poetry and began to see that expression would be my salvation. High school I took four years in ceramics, photography and I was in a singing and dancing choir. I was deeply involved in theatre and was the lead in several plays. I always wanted to be a character actor, but was always cast as the damsel in distress. I took to acting because I could be anything I wanted, it was a relief from an confused sense of self that I had negotiated most of my life. College came and at my mothers suggestion, as I became overwhelmed and lost in the world of academia, that I drop anything but the mandatory classes, and instead pack my schedule with the arts. It was a brilliant idea, and I spent my first year in acting, African dance, creative writing, life drawing and any other art class I could get in to without being a major. I have a Bachelors degree in Women Studies, sans two language courses and eventually graduated with my degree in Art, simply because looking at my transcripts the university said I had enough credits to graduate with it. My life was living in the Honors College and art. Watercolor, ceramics, drawing, sculpture, book making, screen printing, design, photography and a taking to all Mexican art and History of Mexican photography. My life and view found its foundation in Women's Studies, classes like Women as Healers, Queer Theory, Art and Activism, Race/Class/Gender and Women and the Body. I made angry, political art and could see no place for aesthetics in such a divided time and world. I wrote and performed slam poetry in front of at times, hundreds of people. I had continued in theatre and loved improv. I wrote prolifically. Despite all of the arts, I had not yet began painting. Painting classes were restricted to painting majors and the first time I used oil paint was probably six years ago. Acrylic in earnest, three years ago. I had previously dabbled in acrylic painting and had long used charcoal for the visual art I was creating. Today I use oil paint for all of my works on canvas, and acrylic paint for all murals. The last three years have been a whirlwind of painting on a public scale, and my skill set has had to grow with each new artistic endeavor. I still have a very full life in the arts, I write, I take photographs, I read and I dance. It is still my salvation. There is a part of me that has fought for me every step of the way. From the interlopers who might take away my belief in myself. From good friends mired in self doubt who want company, to people who shame women for being ornate or having self worth, for fear of women who are bold or take chances, to fear based viewpoints and to people genuinely shocked to see a woman do what I do. To my innermost self I consider myself a designer, a creator, that title brings me the most joy. I feel that my past, my education, my shortcomings and my defiance, have prepared me for the life I lead today. And the life I will be stepping into. Art has buffered my life in a way that nothing else could have, art at its most fundamental, is humanity expressing itself. I feel most at ease with those who thrive in this space, the freedom of creation, the tenacity and bravery that art requires. That life requires. The commitment. The vulnerability. Many people think that being an artist offers absolute freedom, when in truth it invites both scrutiny and celebration. And it is best to take both with a grain of salt. My greatest wish is to be of maximum service, to not waste my skills to fear. Fear is a powerful destructor and it has killed more dreams than failure ever has. And often when I talk with people I will see that this is where we differ, we have different enemies. I am not in competition with other artists, or women, or men or Donald Trump. I am in competition only with fear. Crystal clear, daunting and piercing in its efficiency, it is my sole enemy. Every painting, every project, every time I step into self expression, every idea I fight this enemy. The voice that tells me the idea is bad or wrong, that I am a dreamer and that it can't be done. Cutting and biting I have trained myself to hear fear's voice and to separate it from my own. I wrap myself in the faith that this is what is meant to be, that I am destined and protected. That life celebrates in my bravery and that the Universe will find the way. Audacious faith. I protect my tender, tender hope and I take actions on its behalf. Sometimes the action is to do nothing, sometimes it is to laugh until I cry with an amazing group of friends, sometimes it's to completely surrender, and sometimes it is to fight. To trudge. To prevail. And life, with profound accuracy has always shown up, the way is always made. I have to believe that life wants me whole, flawed and fabulous. That when I shrink, that I serve no one. That when I act one time on behalf of all the people who cannot, that the whole world shifts. The whole world, shifting under our creative power. What choice we have, what divine, divine choice. That is my lifesong, and I have to sing it to myself everyday. Sometimes I am all alone, and it's just me singing to God. And faintly in the distance, I hear God singing back. Looking back at me through flowers and skies, through color and eyes, people and places, divine and inspired. Perhaps that's all it ever is. Dancing in the dark. I am grateful for the opportunity. Hello all! So it has been awhile since I posted on my blog and I wanted to give you all a real time tutorial on how to paint a flower in oil paint. Often when I post paintings or time lapse videos people will say "You make it look so easy!" Well it can be easy, but first you have to learn the hardest part, patience. What I hope to show in this tutorial is that oftentimes painting comes down to tenacity, and attention to detail. Big broad strokes are far less common than small, dedicated marks. And that ultimately it is pattern making. ** For my supplies I am using Windsor Newton water soluble oil paints, on a black gessoed canvas. I am avoiding the top part of the flower because I will be painting another flower over the top, to make it look like it is overlapping. You can see the final commissioned piece below. Happy painting! Here is a link to a great segment on Don't Wake the Dreamer in Tempe, Az! Here's the link to a report on the Don't Wake the Dreamer mural! This week I have begun work on a 153'x16' tall mural in Tempe Arizona. This mural was commissioned by the City of Tempe, and is their first city commissioned mural! I am very excited to work at this size and for the community to have access to large scale fine art. Just during the outline phase there has been a lot of really good feedback... I will be posting progress videos as I paint, and here is the first one! This Friday I got the privilege to be curated into the Southwestern Invitational, which begins in Yuma and then a select group will travel all around Arizona. I am from Yuma and my family all still live in Yuma so it was great fun to be a part of this. 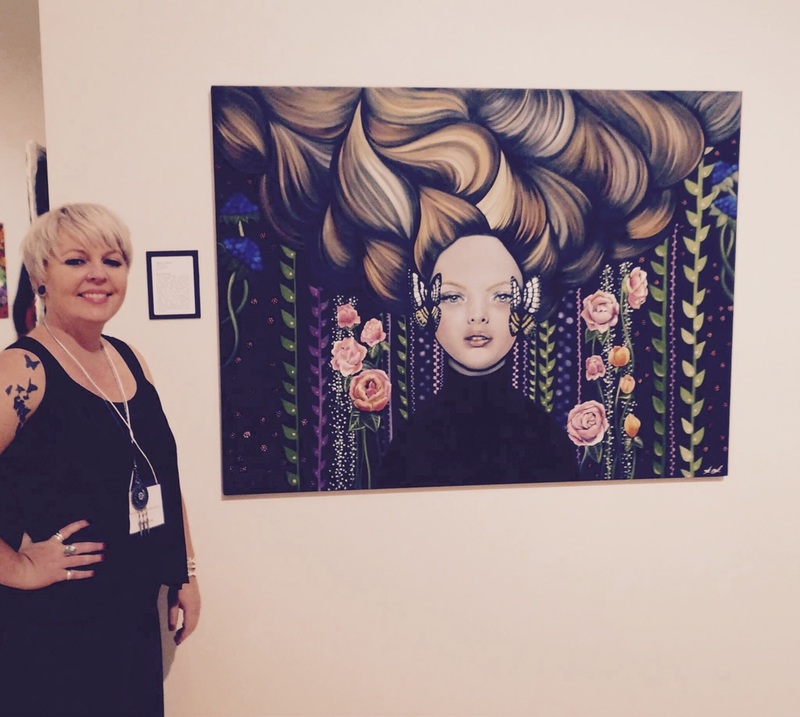 I was really impressed with Yuma's Fine Art Association gallery, I almost couldn't believe it! Beautiful facility. Me with my juried painting, Waves of Sound, photo by Larry Willis. My whole family came with, minus my two brothers who are both in the military. So here was the roster: my sister Lindsey with three of her children, Abby, Rachel and Elizabeth as well as her husband Zeb. Then there was my younger sister Mariah and her son Tristan. My grandma and grandpa and of course my mother Mari. So we were quite a group. About half of the crew. My mom and her friend Tari, looking at all the painting with 3D glasses they found. My mom in shock of how my painting looks in 3D, lol. Love this photo. All in all it was a great experience, and I think I will continue to submit to the Southwestern Invitational. I think it also inspired my family, and is a reminder of how art adds so much to our lives and community! Today last year my very good friend Jeniffer Sarah Foose passed away. She actually passed away in the early morning hours of this day last year, in a hospice room in Phoenix, thirteen days after having been diagnosed with cancer. She had been feeling quite a bit of pain for a few months, but only went to the hospital when it became unbearable. I did not know about any of this because Jeniffer and I were not speaking at the time. She had been my spiritual teacher for four years prior, and as intense friendships often do, we had separated as abruptly as we had been brought together. And two years after we had last spoke, I received a phone call that Jeniffer was in the hospital. I asked if Jen herself had asked that I be contacted (given our lack of communication I did not want to step on any toes) I was told yes she had asked, at that point I knew it was serious. I got in my car and drove to county hospital, when I got to the hospital and saw that her room number was 222 (my spiritual number) and then I knew that Jen was going to die. Here were some facts about Jeniffer's life, she was transgendered, she was poor and she the wisest person I have ever met. Her house was filled floor to ceiling with books, and the other wall movies. She could fly a plane and build a house, both of which she did. She was an artist and an inventor, she often called herself a "Renaissance woman", I suppose that is the female equivalent of a "Jack of all trades". She had at least fifteen different types of instruments in her home, all that she could play. Jen was a spiritual teacher, I would say almost a shaman, or a seer, or in my case a deliverer. 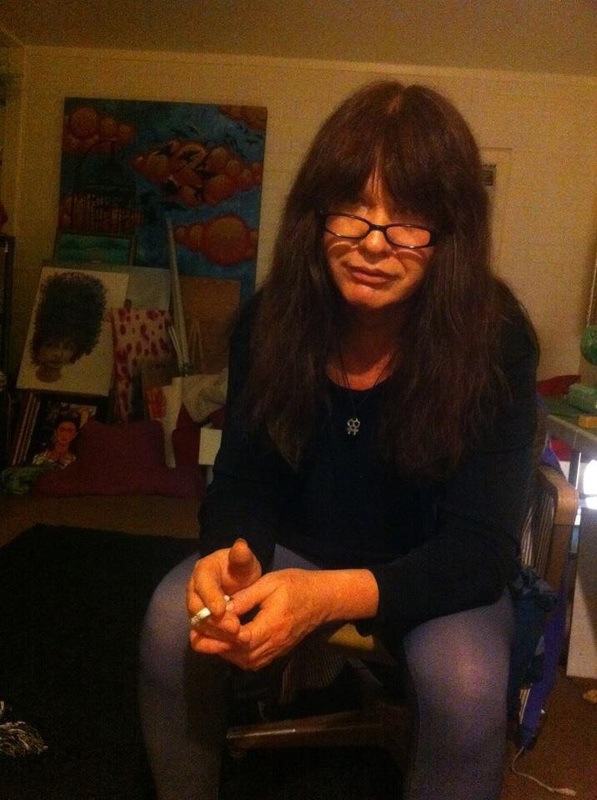 When I first met Jen she was wearing a shiny spandex jumpsuit with a large circular belt, she had a blunt bang haircut and was smoking a cigarette on a Vespa...she looked like a superhero. And I needed a superhero. The next four years I would say we were in daily contact, she taught me how to live, how to show up for my life, how to be consistent and how to walk through fear. She taught me the warriors path. How to live like every decision you make may lead to your death, how to live with authenticity, how to be that deliberate. It is difficult to describe a person like Jeniffer, it seems disingenuous, perhaps even a disingenuous intention, simply because of the size of the personality we are dealing with here. I was in constant amazement of Jeniffer's view of the world and its inhabitants. And never in my life have I had someone repeat me back to myself with such clarity and vision, and in that way I was freed from false thought. And that was any thought that limited God. Jenism's: Random statements that Jen would make that I would write down. "Let every action be a prayer, and every experience a meditation"
"You are here to recover your original intent, to be useful to other human beings"
"You MUST reduce your certainty. As long as you are certain, God has no room to change anything about your situation"
"Not every feeling demands an action. " "Do not make any decision until you are serene about it"
"Live as though Death is on your left shoulder, you simply have no time to waste"
And when I asked Jen what she believes her message is, she replied "Wake up", except she said it very loudly and close to my face. I arrived at the hospital to find my good friend Jen in a lot of pain, thin and afraid. Death is not a beautiful process, and for a 54 year old woman who actively avoided doctors even though she herself was an RN, Jen I believe knew on some primal level that she was going to be leaving planet earth. My schedule cleared and I spent the next thirteen days with Jeniffer as she let go of this life. The last six of those days were spent in hospice with a veritable gaggle of angels, hospice workers are an entirely different breed. The Universe knew to give Jen the nurse who was an old hippie, who went on her smoke breaks and whom Jen instantly would have been friends with. Jeniffer had long time friends from many different states who dropped what they were doing and flew down to be with her one last time. Artists, musicians, homesteaders, scientists and healers. She had that kind of affect on people. I was very grateful to spend her last few days together in the quiet of the hospice. The hospice workers informed me that she would go through the stages of birth but backwards, and that she would change everyday. One day she was still talking and the next that part of her life was simply done. Then it was her eyes no longer opening. Then it was an automated suckling response, just like a baby. I was in awe of this amazing process that is life and death. And honored that I could get to care for Jen in the same way that she had cared for me. That when I was vulnerable and without friends, that Jeniffer provided the spiritual and emotional nurturance that led to my freedom. That she walked through fear with me. And that I was now able to do the same for her. I played her all of her favorite songs, brushed her hair, painted her nails and took her in walks in her wheelchair. I had her dressed in her favorite clothes and I braided her hair. We had beautiful talks during that time, mostly through energy and forgiveness. When she passed out of consciousness I had a waking vision of her next to me in my bed. 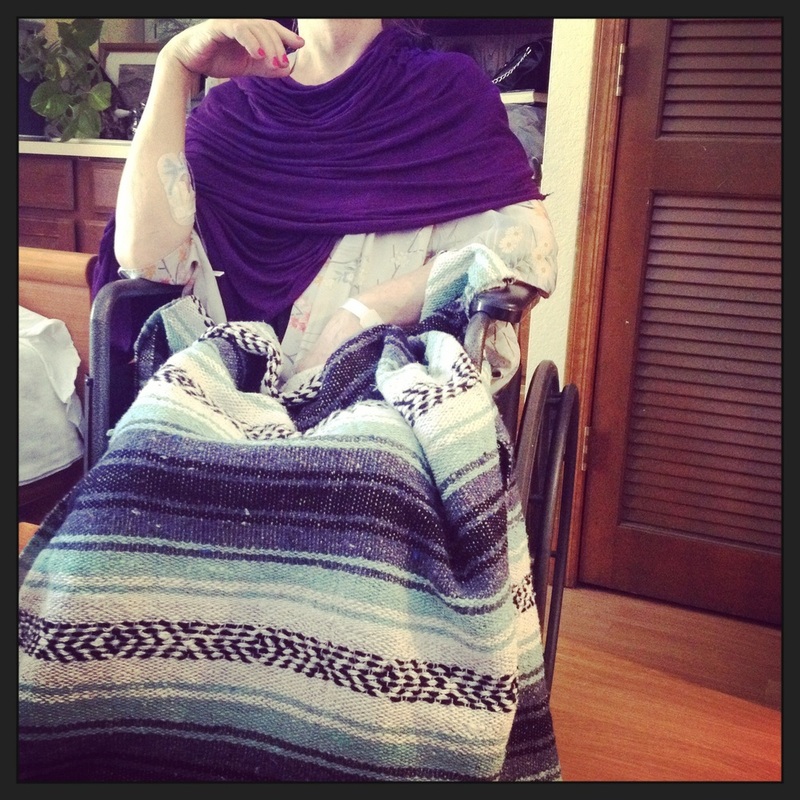 When I rushed to hospice the next day they said she had slipped into unconsciousness. Her good friend who had stayed through the night said "Spacesuit Earth" and tapped her body. She was about to leave her body. I felt Jen would leave on the thirteenth day, as that is a spiritual number, and it was a Sunday, and Jen would not have wanted to be a burden. And just as imagined, on the thirteenth day Jeniffer passed into the next realm. I had no fear, because she was going to that place that she and I had long postulated and philosophized about. I would not fear God and Earth, the very things Jeniffer taught me all about. I have since had dreams of Jen ascending. In my dreams she flies up and calls to me saying "Watch! See this! ", just as she would have in life. Always teaching. Love you Jen. Miss you. I spent this morning filming this with the demolition crew at 222 E. Roosevelt, the developers were very gracious to let me have access so that I could have this memory. I'm so glad I was there. When the first bird went down I cried, and then I smiled. Letting go is like that. Demolition is spectacular and wild, loud and colossal. I got to meet the excavator operator, a older guy named John, smoking a cigarette and drinking a Coke, he was the exact undertaker for the job. I was relieved when I met him, grateful that he wasn't a wet behind the ears newcomer, but instead a seasoned destroyer. I've always thought "every great creator knows the beauty in destruction", this Arizona morning was like that. When I was driving up to the site which was blocked off by fences and privacy tarps I could see the excavator looming large over all of that. It deftly reached down and picked up a whole tree, uprooting it and moving it quickly to the side. I felt like I was in the presence of a dinosaur, I immediately felt vulnerable and awed by its power. I parked and entered the site, similar to how I felt last year walking into the hospital with a terminal friend. I knew exactly what I was there for. I got to speak with John before the building went down, he knew that I was the artist that had painted the mural outside. I told him "John, you're like a surgeon with that thing", pointing to the massive excavator. He replied "So are you, with a brush", pointing to my mural. He apologized for his role in the demolition of my art and I told him, you know there is beauty in the breakdown. I filmed as the building was demolished and I felt so very grateful to be there. Had I just drove upon it I think it would have been very difficult for me, it was necessary that it happened this way. This last Friday my name was published in the New York Times in connection with this whole thing, and with my painting the Three Birds in Flight, once the new five story building is built. I never thought I would see my actual name in the New York Times, it was a huge milestone for me as an artist. And I hope that my working with the developers is an example of how we as artists can shape our futures and our neighborhoods. We are not victims but creators, and I make decisions as they become available to me. There is a zen quote "Don't push the river"... I do not believe in a world of mistakes and regrets. But one of destinies, next right moves and choice. The Three Birds mural gave me more than I ever could have asked for, both in its creation and in its destruction. God is efficient, that is all that keeps coming to mind. Last night my latest show titled "Oil and Ink" opened last night at greenHAUS Gallery and Boutique, 222 E. Roosevelt. Here is what is crazy about greenHAUS, me and destiny. So for several years the number 222 has been my "God Number". Basically I see it everywhere. I had even gotten into the habit of taking pictures every time I saw this number, on billboards, at the gas pump, in change...I just saw it everywhere. So I started to believe that the Universe was trying to communicate with me through this number. Eventually I started to take it as a sign that everything was well, when I saw it I would feel as though the Universe was with me, nudging me on. So, when I moved to Roosevelt Row (Phoenix's art district) as a sort of pilgrimage in 2011, I would always look at the building on 222 Roosevelt. At the time it was vacant, and so I took down the renters number, not sure how this building would play into my life, but somehow instinctively knowing it would. Several murals were put up on the building, advertisements ect, much to the dismay of the neighborhood. Then. There came a day where the last mural that was up there was covered, and the whole building was painted this really awesome green shade. There was a collective sign of relief, and I was slightly sad because I knew "my" building was now occupied. Shortly after this, I came home from work teaching art and I had two voicemails and three facebook notifications that this building and its owners were having a design/mural contest. They were accepting applications and budgets for a building size mural and four of my friends had let me know about this. When I saw that it was 222 Roosevelt, I had to take pause. I couldn't put all of my spiritual faith in this one act, but silently I knew, if I won this- that was lifetime proof that there is a God. So I got to designing, I knew they were going to need something modern and fine art. Something uplifting and hopeful, something that would watch over the street. Something spiritual. Birds. Birds through almost every culture represent spiritual release and freedom. I added circles over their heads to denote their spiritual nature, similar to an aura or halo. I created my design, and my budget and sent off my proposal. Several weeks later I got the call, I had won the design contest, they wanted me to paint their mural. I was so elated! I knew there was a creative, intelligent force that operates through signs and symbols. I also knew I had never painted a mural before. I got on the phone and started calling every muralist I had known, which was approximately one. Turns out you have to use acrylic paint (I am an oil painter) and ladders and lifts (I have a known fear of heights)...so I set to learning how to use acrylic paint, and I bought some extension ladders. There were some delays in getting the painting up, which led to the first night painting being a First Friday. So with cameras clicking away and thousands of people walking by and observing, I got to painting my first mural. Talk about trial by fire. I knew it would change my life. I am now a full time painter and muralist, but now I use electric lifts and not extension ladders, and acrylic paint has grown on my in its virtues and necessity...and its bright colors! The Three Birds Mural has become an icon and its influence has surpassed me, nearly every time I am downtown I see girls in front of it taking pictures and I wonder how many pictures have been taken in front of it. There is so much responsibility in creating public art, I really am honored and continue to be honored by my small contribution to our visual world and experience. I have had a show at greenHAUS for every year since the mural, so last night opened my third show with greenHAUS and sadly my last. They (the owners) will be packing up and moving shop to Portland, Oregon come February, and fate of the Three Birds Mural is no longer secured. But, it has had a good run, oftentimes murals are temporary as our public space is always shifting. Either way, it will always be my most special mural. Here we will tell stories, things that didn't happen, or didn't happen that way. Stories about making stuff, making stuff up. Shots in the dark. That life could be that way. That life is magical. That we could change the story.